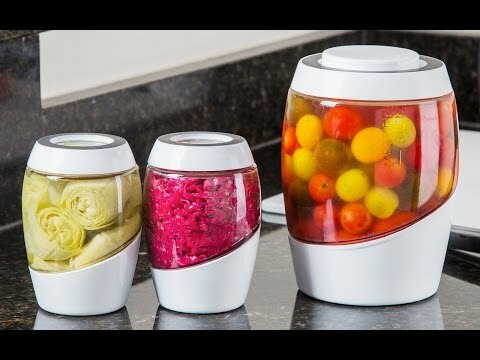 This fermentation pot is a sleek, modern twist on an age-old tradition that helps promote a healthy digestive system. Whether you’re a veteran fermenter or looking for an easy induction, Mortier Pilon creates the perfect anaerobic conditions for your next batch. Its water seal system lets gas escape but keeps air out. Use the rewritable lid to keep track of whatever nutrient-rich creation is inside. Capacity: 2 L: 67 fl. oz. ; 5 L: 169 fl. oz. Dimensions: 2 Liter: 5.75" x 5.75" x 7.65"; 5 Liter: 7.51" x 7.51" x 10.11"
Weight: 2 Liter: 3.09 lbs. ; 5 Liter: 3.53 lbs. We love this crock. Actually is our second. When we saw how good the small crock works we bought the big one. We use them to ferment the cucumbers, sauerkraut and other veggies. This was a gift for my son. As soon as he received it he was very excited and used it immediately for sauerkraut. He loves it.